Marinablue is a 57-story Arquitectonica condo development completed in 2008 in the Downtown Miami neighborhood called Park West. Marina Blue has 516 condos and lofts, all with floor-to-ceiling glass windows and direct views of Biscayne Bay. Marina Blue is Hyperion Development’s second condo project in Miami. The stellar amenities at Marina Blue condos include: sunrise and sunset pools, hot tub and plunge pool, 24-hour security and concierge, valet parking, business center, fitness center, yoga/aerobics room, BBQ grills and outdoor dining area, club room, 5-hole putting green, and Wi-Fi Internet access throughout the common areas. Marinablue condos is walking distance to the American Airlines Arena, the Shops at Bayside, and the Adrienne Arsht Center for the Performing Arts. Marina Blue has sweeping views of the ocean and the bay along with the convenient location in Park West. What is the address for Marina Blue? Marina Blue is located at 888 Biscayne Boulevard, Miami, FL 33132. Which utilities are included in the Marinablue condominium association dues? XFINITY from Comcast with over 140 channels, water, sewer, and trash removal come included in the condominium association dues. 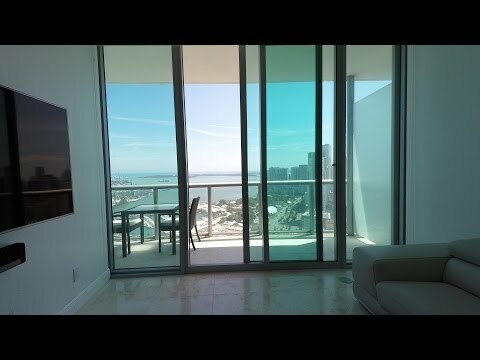 What are the rental restrictions for Marinablue condo? Owners may rent their units a maximum of three (3) times per year. No lease can be less than three (3) months. What is the pet policy at Marina Blue? Marinablue is a pet-friendly condo development for both owners and renters. The pet policy permits each residence to have no more than two (2) pets, each with a maximum weight of 45 pounds. Prior to move-in, tenants who are pet owners must pay a non-refundable pet fee of $500 to the condo association. On which floor(s) are the amenities located at Marina Blue? The business center is located on the lobby level. All other amenities are located on the 14th floor.